We are glad to host artist Caroline Corbasson for 3 days at LAM. 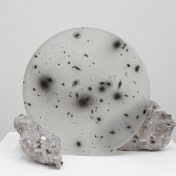 Her amazing work is partly inspired by astronomy, telescopes, large structures, or even mirrors. Visit her website to travel through space and art.